Treat your guests to this Challenging Mega Xtreme Challenge Obstacle Course. Put them to the test as this Obstacle Course will sure be a challenging yet fun Bounce House Obstacle Course. Are you and your co-workers ready to take this challenge on? Need additional Tables, Chairs, or Canopies we can help! This radical course uses Three of the four available units to create a Mega Xtreme obstacle course challenge. 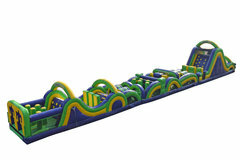 Compete with your family, friends and co-workers in our interchangeable obstacle course!